Can You Buy 100% Bison (“Buffalo”) Hot Dogs? The classic American cookout food – the hot dog. It will be making it’s appearance in grills across the country, every weekend through Labor Day. People have different opinions on hot dogs. Some don’t care what it is, as long as it’s in their bun. Some can only have all beef dogs. And those on a diet, turn to the all turkey variety. But have you ever had a hot dog made of 100% bison? Do these even exist? I never came across them until this week. 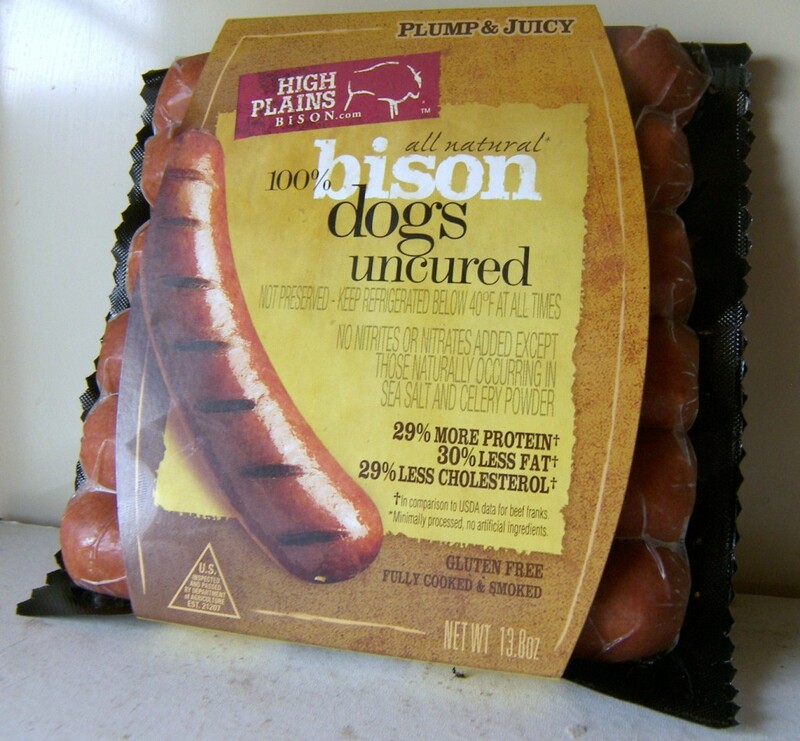 I found a package of 100% bison dogs made by High Plains Bison. Before we get onto to talking about the hot dogs, I need to point out you will not hear me using the word “buffalo” in place of bison. Buffalo and bison are two different animals. A buffalo looks more like a cow with gigantic horns sticking out of the side of it’s head. They may make hot dogs out of buffalo, but I don’t know. I am only concerned with the American Bison, like the one you see on the right. High Plains Bison Dogs are 100% bison meat, no fillers are used. 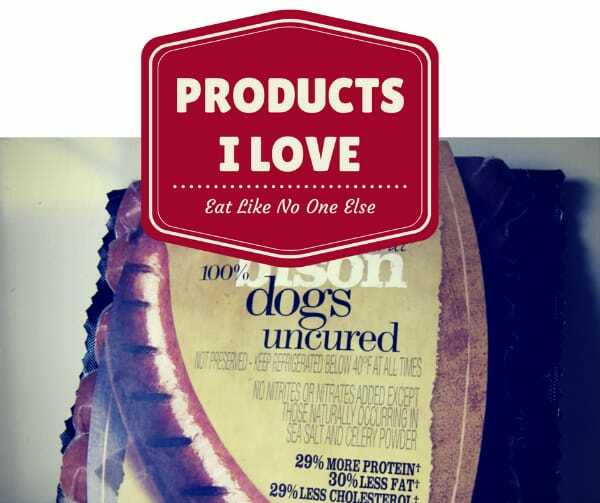 Also they contain no added nitrates or nitrites (except those naturally found in sea salt and celery powder), making these uncured dogs. The full ingredient list is: bison, water, vinegar and lemon juice concentrate, sea salt, turbino sugar, spices, and celery juice powder. It’s nice to buy a hot dog and know what every ingredient is. There is no sodium phosphates or potassium lactates. The bison meat used for these dogs comes from bison that has not been raised on hormones or antibiotics. In fact the USDA does not permit the use of hormones in the rising of bison. High Plains Bison Dogs are some of the most amazing hot dogs I have ever eaten. They are plump and juicy just as advertised on the packaging. They have a nice smoky flavor that isn’t going to scare away traditional all beef hot dog lovers. They are filling. I often will eat 2 hot dogs in a meal, but 1 was satisfying enough. Are Bison Dogs Better for You than Beef Dogs? Let’s look at the numbers. I will compare the nutrition facts of one High Plains Bison dog to one of America’s most popular hot dogs, the Ball Park Beef Frank. Please carefully note that the serving size of the Ball Park dog is 57g, while the serving size of the bison dog is 65g. Yet the Ballpark dog is higher in calories, fat, saturated fat, cholesterol, carbs, and sugar than the significantly larger bison dog. The Ballpark dog also contains 7g of protein, while the bison dog contains 9g. So it looks clear to me which dog is better for you. Bison meat tends to be leaner with less cholesterol and more protein. You can buy all their products by visiting the High Plains Bison website.